Ever since 2008 I have been in the habit of noting down the books I read. What started as a practical means to keep track of titles used for university research has become an ever-lengthening list that is almost diaristic. When I flick through the thin pages of my notebook I am reminded of what I was doing, and what I was thinking by the books I was reading at the time. The earnestness of my early 20s hinted at by Winterson, Nin, McEwan. A time of loneliness tempered by month-long binges of Angela Carter. A quarter-life panic both soothed by the reliable brilliance of Atwood and Lawrence, and interrogated by rounds of de Botton and Orwell. The months where I read few, or God forbid, no books at all point are significant in their emptiness, suggesting times when love or grief or fatigue occupied my mind with such extremity that it was impossible to think about anything else. So precious is this notebook to me, this faithful scribbling of books encountered, that recently it was one of the eight or nine things I felt compelled to take with me when clearing out of a house under threat from bushfire. There are a few rules I try to adhere to. Half-finished books don't feature, but unpublished manuscripts do. Books completed for work, for research, for pleasure are all in there together, as are the titles and guilty repeat-reading I would rather not boast about. Honesty is important, as it results in both truth and intimacy. Privacy, too, is necessary. It, in turn, encourages honesty. 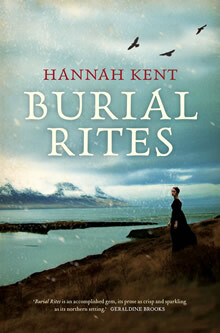 At the beginning of 2013 I was gently warned that I might not have time for reading or writing because of the release of Burial Rites, and the associated travel I would need to do. Not being blessed with the ability to write steadily (or well) while in transit, I did struggle to write as often as I am usually accustomed. But reading? What better occupation on a long-haul flight, or on a gritty, sleepless, jet lagged night, than to open a book? Here is a selection from the books listed in my notebook for 2013, one title for each month.